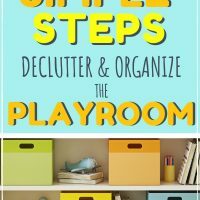 If you are feeling overwhelmed with your kids’ messy playroom or play space, then you are in the right spot! 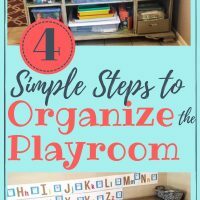 I have practical ideas to help you with playroom organization—easily and quickly. Kids’ areas can take over a home and become a cluttered mess so quickly. 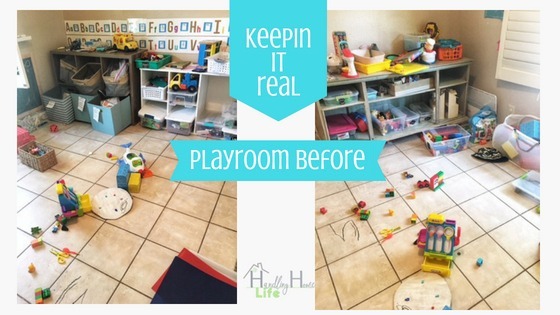 Whether you have a dedicated room for playing or a space for your kids’ toys and things, you have to tend to it regularly or it gets out of control. When home shopping a couple of years ago, we chose an older home with lots of square footage versus a newer home that was significantly smaller. We knew we would enjoy making the aesthetic updates ourselves and we could take our time to do so. SHORT ON TIME? 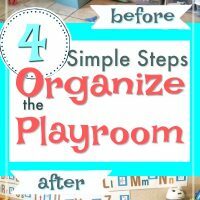 SAVE TO PINTEREST NOW & READ ABOUT PLAYROOM ORGANIZATION LATER! This post may contain affiliate links meaning that I may earn a small percentage (at no extra cost to you) if you make a purchase through a link that I share. See full disclosure. While it’s nice to have more room, a bigger house can mean a bigger mess! Our diy playroom is actually a “formal dining room” but we don’t formally dine, so it became the playroom. The only drawback is that it’s visible as soon as someone walks in the front door, so I try to keep it from looking like a total pig sty. My kids have several designated play areas throughout our home that I will organize in future posts. But, today, we will do some playroom organization in our formal dining room turned playroom. RELATED: If your kids’ DVDs are a mess then be sure to check out this post for how to organize DVDs. As I mentioned earlier, this is the formal dining room that we turned into a playroom. It’s to the left as you enter the front door and is open (no doors). It’s also connected to the kitchen which is why I like using it for the playroom so I can prepare meals and still see the twins playing. As you can see, the playroom organization was non existent. Here are the steps that I took to reign in the chaos. Decide on the purpose for your kids’ playroom. 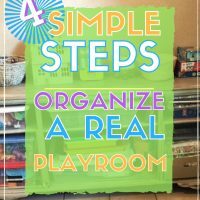 My goal is for the twins (age 5) to have a playroom where they can easily access their things and quickly put everything away. 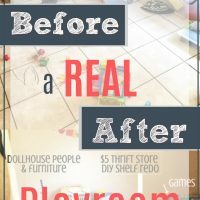 I took everything off of the shelves, pulled the shelves out and collected all the toys that were lost and forgotten, and made a great big ugly pile in the middle of the playroom floor. First, throw away all of the broken toys, dried up play dough, etc. Now, gather all of the toys your kids have outgrown or no longer play with so you can donate them. Sometimes I ask for input from the kids, but more often than not, I just make the executive decision. BONUS TIP: I put the outgrown/unloved toys in my donate box and immediately put it in the trunk of my car to prevent kids suddenly remembering how much they ‘love’ some toy they haven’t seen in 6 months! If your playroom is anything like ours, you should now have a MUCH smaller pile than what you started with! Now it’s time to sort and put like items together. NERD ALERT: This is my favorite part!! Probably because I have an obsession with baskets, containers, and any kind of storage item! 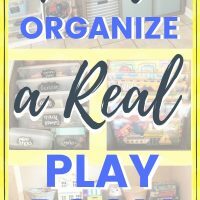 So I love playroom organization hacks—or any kind of organization hacks!! But here’s the thing-I’m a practical organizer. 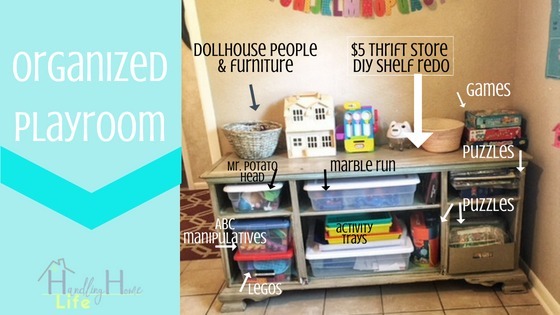 I’d love for my playroom organization to look like the pictures on Pinterest, but my #1 goal is function! 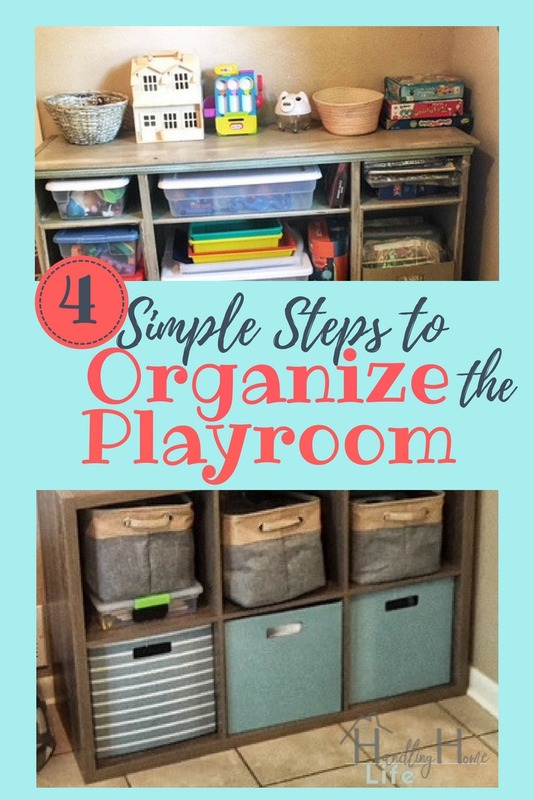 Whatever your organizing style, you will need something to corral everything for playroom storage and shelves of some kind. The white shelf in our playroom is a tall book shelf that I probably got from Ikea. I turned it on it’s side and took out some of the shelves. The other shelf in our playroom was an ugly old media table (I guess that’s what you’d call it), that I got for $5 at a thrift store. I brought it home and redid it into a pretty cute little playroom storage spot! A cubby shelf and storage bins will give you lots of room for storage as well and help with your playroom organization. 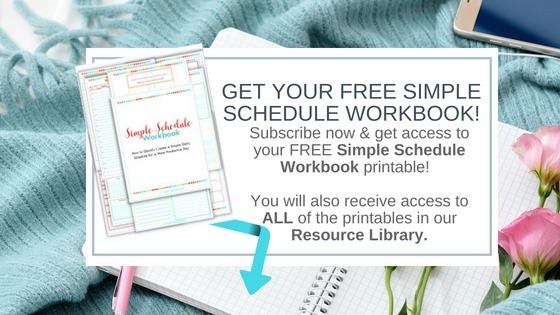 If you need ideas to organize your daily routine, then be sure to read this post on Time Management for Moms, and download my free printable below. Most of our playroom items are sorting-no-brainers. All the Lincoln logs go into a tub, all the Mr. Potato head pieces in a tub, etc. But I also strategically place similar items next to each other on the storage shelves. One of my favorite playroom organization hacks is to store each puzzle inside one of these and larger puzzles in these bags. Then all of the puzzles and games are placed in the same area of the shelf. I place all of the building toys on a shelf together, all of the art supplies on another shelf….you get the idea. This makes it easier to remember where things are and where to put them away. I also label most everything. When the boys were younger, I labeled everything with pictures. Now I keep lots of these chalkboard labels in various sizes on hand to help keep everything organized. RELATED: Fine Motor Activities that Kids LOVE! When I am organizing a space, I don’t clean until I have purged and sorted. I pull all furniture away from the walls and clean the baseboards, the floor where the furniture sits, and even the walls. Then, I wipe down all of the shelves and put them back in place. I don’t clean the rest of the floor or windows until I have put all of the sorted toys onto the shelves. Make sure you are keeping your kids and family safe with non toxic cleaning products. My favorite cleaning supplies are magic erasers and microfiber towels, and this is the only Non Toxic Cleaner that I use. A good rule: Play with one thing at a time. If a one of the kids wants to play with the marble run, then he can take out ONLY the marble run tub. When he’s finished playing with it, or if he has gotten side tracked and wants to now play with Mr. Potato Head, he MUST put away the marble run before getting out the next activity. This takes A LOT of teaching, modeling, and monitoring. As with everything, we practice the steps and what it looks like to take one activity out, play with it, and put it away properly. This is the same method that I use to teach kids how to do chores. Read the post here for organizing tips for kid’s books and how to set up a book rotation! Our home has an open floor plan so there’s a huge family room/living room/formal dining room. We certainly have no use for a formal anything, so half of the room is for our tv area and the other half is where the kids’ books, Lego table, and musical instruments are. 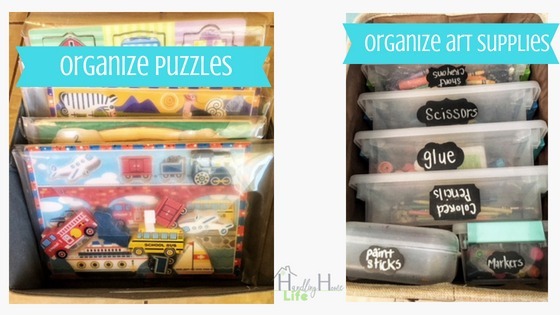 What are your favorite organizing tips and tools? Leave a comment below and tell me! I’d love to know! —>Be sure to check out the Handling Home Life Pinterest board below for more ideas to help you handle your home, kids, and busy life! BEFORE YOU LEAVE….will you do me a big favor? Amazing! Such a creative though to organize kids messy toys. Mom has to busy most time to arrange kids messy zone. It’s must helpful to organize kids playroom. 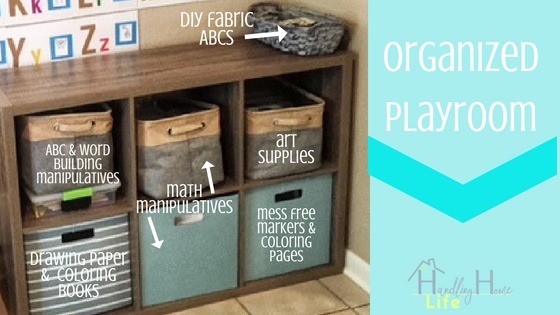 Thanks for such a helpful kids playroom organization ideas. Haha! That’s how I feel when decluttering the kids’ toys! Good luck Ali!